Plus nothing beats no bake goodies on hot summer days! In a large saucepan melt butter and marshmallows over medium heat, stirring until completely melted. Turn off heat and stir in vanilla and cereal. Mix well and gently press into greased 9x13" pan. Let cool for at least 30 min. Melt white and milk chocolates in separate bowls. Cut treats into squares and dunk half of each one into desired chocolate and immediately coat with sprinkles if desired. Lay on wax paper until set. Store in airtight container up to 2 days. Ok. Now I'm craving rice krispie bars! I bet you could melt some different color candy melts and do a whole rainbow of treats. Might have to look into that! These are great! I hope you will add them to my Patriotic Project Parade. These look delicious!! I have pinned and shared on Facebook. Thanks so much for sharing, we will have to give this one a try!! Have a blessed week! Rice Krispies in chocolate? The forefathers would have wanted this :) forreals, I love krispies. I used to not like them, and then one day, something in my brain said "you're demented, rice krispies rock" and I just became obsessed. These are perfect for July 4th! 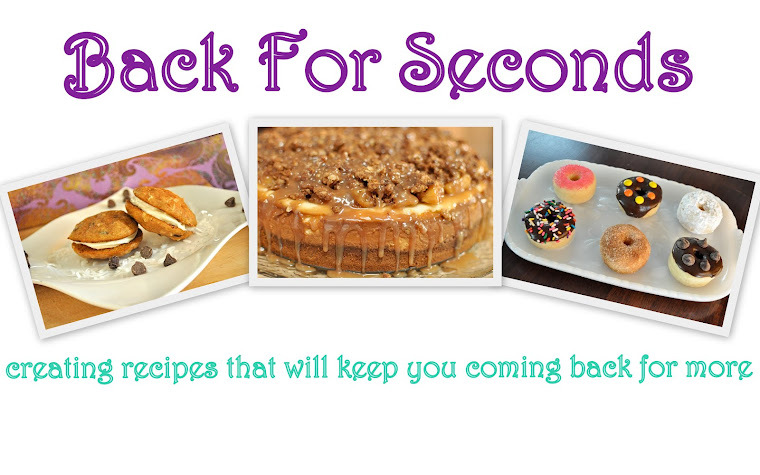 Holla @ no bake treats! Thanks for linking up. I have been craving rice krispie treats lately. What a FUN idea! I hope you will come over to Cast Party Wednesday and share it with us. Thanks, I hope to see you there! Super cute and yummy looking! I would love for you to share this (and any other creations) at Pin It and Win It Wednesday @ www.cheapcraftymama.com! Not only do these look amazing, I bet they taste amazing too! I absolutely love the idea of dunking. I'd love for you to link up at Fantastic Thursday. http://www.fivelittlechefs.com/2012/06/fantastic-thursday-2.html Hope to see you there! It's amazing how dipping a treat in chocolate takes it up a level or ten! These are perfect for 4th of July and so easy to change up the color or sprinkles to make then work for any occasion! Thanks for sharing! Rice Krispies and Chocolate always wins with me. I always snicker to myself when I see them sold in stores. I was in a Denny's the other day and they were selling them. I couldn't believe someone would pay that much for something so easy to make. YUM! I will have to add this to my 4th List!! so fun! I am going to pin this!! These look great! 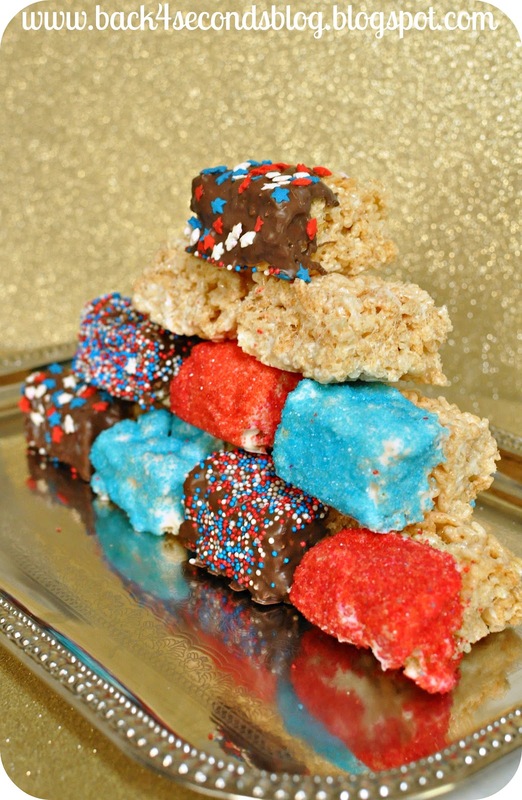 I have a friend who LOVES rice krispie treats and it always makes me laugh when he asks me to "bake" some for him... theres basically nothing to "baking" them haha! ooh, yum! Such a fun 4th of July treat! yum, dipping anything in chocolate makes everything better. Yummy and cute!! Love it! These are so perfect for the Fourth! Always love seeing what you'll link up each week. These look delicious! Very creative! I'd love to invite you to share this with my readers on Saturday Show & Tell on Cheerios and Lattes, I know they will love them as well! Have a great weekend! Love these! I can't wait to make treats for 4th of July :) Thanks so much for linking up to Creative Thursday this week. I can't wait to see what you link up next week. Have a wonderful weekend. OOOH WHO KNEW YOU COULD MAKE RICE KRISPY TREATS SOOOOO MUCH BETTER!!! Hi there!! Thank you so much for linking up to Weekend Potluck. We would love to feature these this week. Would it be possible for you to link back from this main page rather than from a separate link page? These are so cute and such a great idea!! What an absolutely perfect treat for Independence Day!! I didn't think rice crispy treats could get any better! Thank you for proving me wrong! These look fabulous. Thank you for sharing this recipe at our Summer BBQ Bash! I love everything about these! 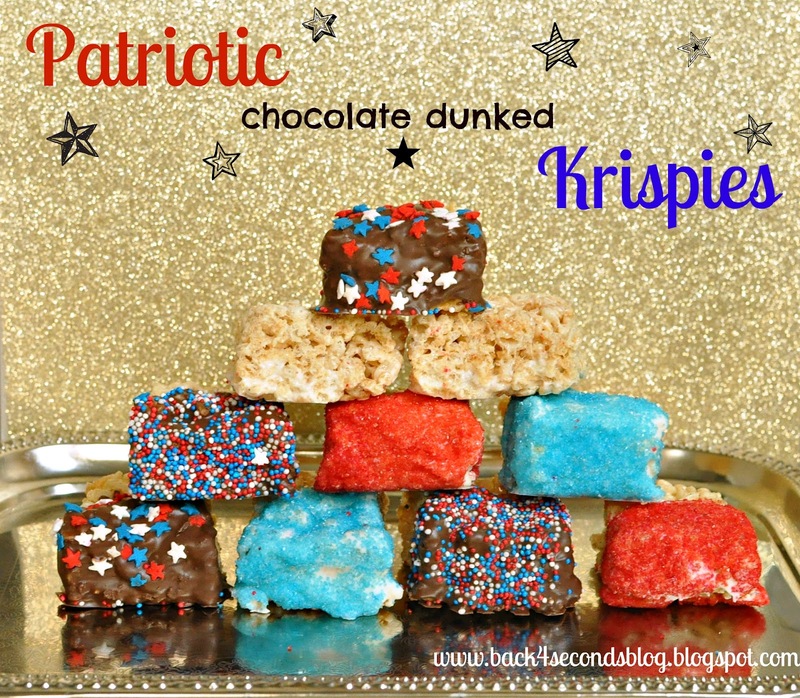 Sprinkles.. chocolate.. patriotic.. check check check! So cute.. and I bet they are so delish!